No British Motor Show in 2012 | What Car? 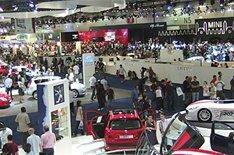 There will be no British Motor Show in 2012, the organisers have confirmed. The news comes after the proposed 2010 show was cancelled in March 2009 a decision attributed by the organisers, the Society of Motor Manufacturers and Traders (SMMT), to the fact that the economic downturn made it impossible for the industry to commit to a 2010 event. Since then, the SMMT has been consulting with the UK motor industry about reviving the event. However, today it announced that the show would not be reinstated in 2012. According to SMMT chief executive Paul Everitt, In recent years the show has played a less important role in influencing new car buyers, and vehicle manufacturers are focussing their limited resources on events and activities that have a more direct impact on brand awareness and consumer decisions. The decision ends more than a century of British Motor Shows. The first was held at Crystal Palace in 1903, and the final one took place in 2008 at ExCeL in Londons Docklands, when 472,300 visitors came to the event.